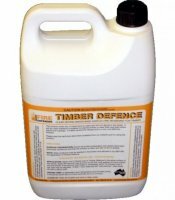 Fire Defender Timber Defence is the most cost effective fire retardant solution for unsealed timber on the market today as it requires no other primers, undercoats, sealers or top coats to comply to Australian building standards. Dries clear leaving natural timber finish - can be top coated. AS3959-2009 Bushfire compliance when used on pine timbers. Please read product listing for greater detail and links to test reports, datasheets AND Using Timber Defence.